I really hope that by the time this goes to print that the summer will remember how to behave and the sun will have put his hat on. As I write, the rain seems to have forgotten how to stop, we all watched the Queen brave hours of damp and cold, and many of us partied in the rain to celebrate the Jubilee. Right now our pre-arranged idea of a camping trip to France seems like a big mistake. One thing that cheered me up recently was a visit to a fantastic local Craft Makers Market where I spent a very happy hour drinking tea, eating cake and looking at the fabulous creativity of nine varied craftspeople – and all in the dry. Becca Williams, who lives in Alvechurch, is a jewellery designer and silversmith who graduated from the Birmingham School of Jewellery and then honed her skills in Birmingham’s jewellery quarter. Becca’s exquisite silver jewellery is influenced by her memories of childhood holidays by the seaside in Wales. This influence is clearly seen when she juxtaposes matt and polished silver “pebbles” with fossilised coral and freshwater pearls. Jennie Eddington makes decorative glassware by using patterned tissue paper on glass to produce colourful vases, tea light holders and scented candles. Her stall was light, bright and very pretty. Holly Careless graduated from Cardiff School of Art. Her work involves illustration, paper sculpture and mixed media and is witty, playful and funky. There were framed drawings and prints, mini suitcases made from card that would make wonderful gift boxes, cards and much more. Tess from ‘Tess Creations’ uses Swarovski crystals from Austria and semi-precious gemstone beads to construct jewellery. Crystal necklaces and bracelets, pendants, drop earrings and silver jewellery were all here – great for weddings, proms and nights out. Fran, who calls her brand “Ixykix”, completed a degree in Textiles at Winchester Art School and now makes unique jewellery and accessories. She creates work using a combination of vintage and reclaimed materials along with modern elements, frequently using resin to cast these found objects into brooches and other wearable and decorative items. Unique, unusual and delectable. Karoline Rerrie is a full-time artist/illustrator who uses the silk screen process to produce cards, books and framed prints. This is affordable, contemporary work that is very easy on the eye. Carolyn Morgan creates her own designs to produce a range of stunning stained glass work (pictured right) in the Tiffany style. 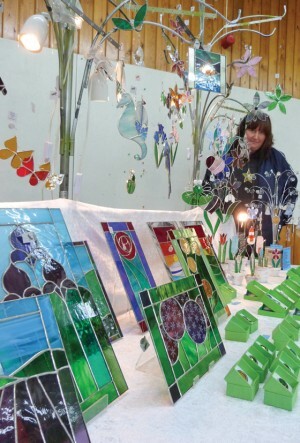 Carolyn’s stall was dripping with colourful glass mobiles and a multitude of decorative items. Glass looks amazing against the light and great in a window or on an illuminated shelf. Neil Spalding, who runs courses at Avoncroft Arts Centre, was selling his irresistible ceramic mini buildings, mostly inspired by local architecture. There were also some very useable and pretty bowls on his stall. Rachel Stowe, who is the driving force behind the Craft Makers Market, was being “mother” with teapot in hand on the refreshments stall. Rachel dyes and hand prints brilliant silk and velvet fabrics which are then made into scarves, bags, ties and the like – gorgeous! Whatever the weather, do visit on August 5, September 2, October 7, November 4 and December 9. There is something else that has greatly cheered me in these damp, wet days. I entered a recent painting of mine for the prize exhibition at the RBSA (Royal Birmingham Society of Arts). I kept my fingers crossed that my work would be accepted but then received a phone call to tell me that my painting had won first prize! The painting is called Hopwood Hills and was inspired by a local scene when we had a light dusting of snow earlier this year. Maybe I should have a go at painting rain next!